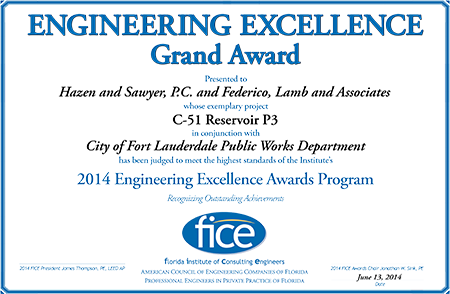 For the second consecutive year, the C-51 Reservoir project received the 2014 Grand Award for Engineering Excellence from the Florida Institute of Consulting Engineers (FICE). Environmental Engineers Hazen and Sawyer and Environmental Consultants Federico, Lamb and Associates were recognized for their ongoing work on the project. FICE represents the professional and business interests of professional engineers in private practice in Florida and their companies, serving to advance the profession of consulting engineering. The organization represents and promotes the business of engineering, the environment in which engineering is conducted, and the image of engineers in private practice. In these capacities, FICE serves as the state affiliate of the American Council of Engineering Companies (ACEC). As the affiliate of the Florida Engineering Society's (FES) Professional Engineers in Private Practice (PEPP), the organization strives to show how doing business with other FICE firms supports better business practices in Florida. ©2014 Palm Beach Aggregates, Inc. All rights reserved. Web design by AMG Creative.